For performance and scalability, install ESI on a controller host machine that is dedicated to ESI and separate from the SCOM Management Group machines. For load balancing, you can use multiple SCOM agents to monitor a large number of storage systems. You can also set up multiple SCOM agents to communicate with one or more ESI hosts running the ESI Service. To achieve the best scalability, assign storage systems with a large number of components to different SCOM agents running on your most resourceful computers. Open the SCOM Operations Console, connect to the SCOM Management Group, and then open Operations Manager > Agent Performance > Module Count. 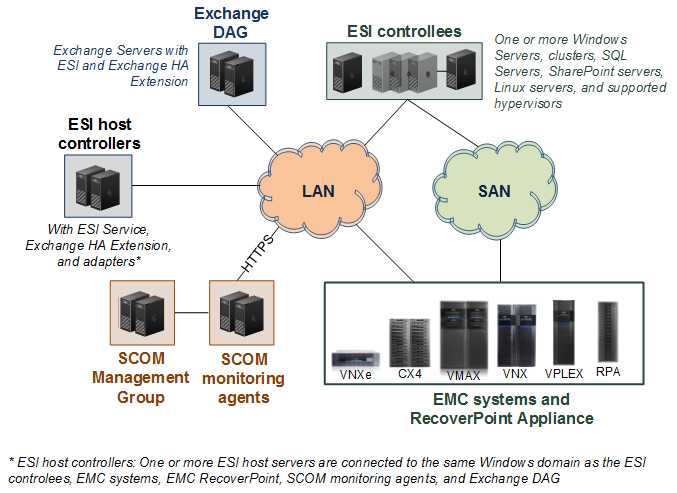 The following diagram represents how one SCOM Management Group that is running the ESI SCOM Management Packs connects to multiple SCOM agents, which connect through HTTPS to one or more ESI Services.